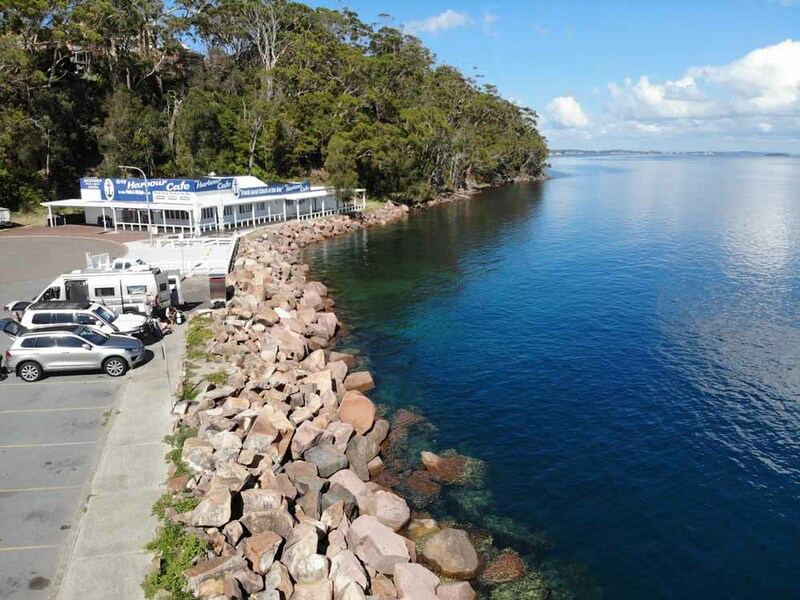 Michael McFadyen's Scuba Diving - The Pipeline (Sewage Pipe) One of the great advantages about a dive trip to Port Stephens is that if the weather is extremely bad, there are many excellent dive sites that can be dived in virtually any conditions. One of these dives is the Sewage Pipe dive. 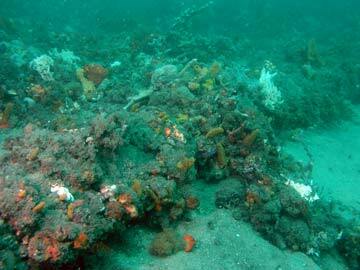 Of course, you should not restrict yourself to diving these sites in poor weather. A good plan for a dive weekend here is to do a couple of boat dives on either Saturday or Sunday morning and a shore dive or two on the other day (even a Saturday night dive as well). This dive is called The Pipeline (it used to be commonly called the Sewage Pipe). It is named after the sewage pipe (at least that is what I was told it was back in the early 1990s) that is located past the fishing co-op building which is found past the main marina. It can really only be done on a high or low tide although you may be able to do on an incoming small (1.4 or 1.5 metre) tide. I would recommend doing on a high tide. Note that the local dive shop says that the high tide here is a little later than at Fly Point and they recommend entering the water about 10 to 15 minutes after the high tide at Fort Denison (Sydney Harbour), but I prefer getting in at high. A point to note, I do not think that the pipe was ever a sewage pipe but it does not work now so there is no danger to divers. The Pipeline - park in the carpark here and walk past the cafe and enter the water at the far end of the cafe. Dive is back towards drone or to right. Travel towards the main marina and turn into Teramby Road at the roundabout. Go past the marina to the end of the road. Park in the car park as close as you can to the turn-around at the end of the street. Walk to the west along the pathway to its end and you will see the entry/exit point, a good set of steps that go down into the water and a cleared section of reef. Note that my preferred way to do this dive does not use this as an entry point but you could if you wanted to. If you do enter here, just swim out to about seven metres and then follow this depth to the west till you hit the pipe (see later). You can do this dive three ways, the first is a bit more adventurous and the second is the normal way and the third way a better dive. Anyway, gear up and walk along the promenade to the north-east (towards the open ocean) till you come to the first light pole. Just before this you will see a good spot to climb across the rocks that make up the retaining wall to get to the water. Once in the water, drop to the bottom and you will see that the rocks slope down to a sandy bottom at about nine metres. As mentioned, the bottom is sand and the reef edge is actually the artificial wall of the marina which was built (I think) in the early 1980s. From here head to the south-west along the edge. After about 10 metres you will come to the remains of a large fish trap. Have a good look around this location as an anglerfish is said to live here (we could not find it despite a concerted effort by many). From here continue along the wall. There is lots of fish here, including large schools of luderick and bream (amazingly, the fishers above do not seem to catch anything). There are some swim-throughs created by the boulders and many small overhangs. Moray eels can be found inside and you may also see a few tropical species. The depth of the sand will gradually come up to about six or seven metres. When you get to this depth, you will see that you can follow this depth out to the right around the side of a sort of small hill. Keep at six or seven metres and swim to the north-west and then west. You will begin to encounter some sea grass and kelp and then some sponges. 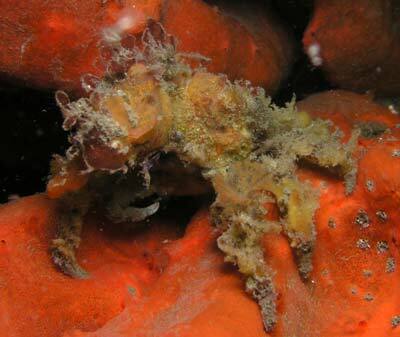 As you go, look for sea horses, nudibranchs and more. The sand can also be home to very large flatheads. The second way is to walk west past the cafe and you will see a set of steps that go down into the water. Once in the water, descend and head north till you are in about 7 metres. Then head west and gradually drop deeper. Soon the sponge life becomes quite prolific. 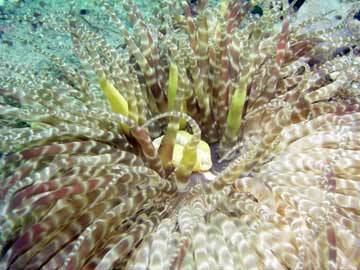 There are lots of sand anemones here as well. I have never seen these anywhere else. This is really a beautiful location. Zig-zag a bit until you hit The Pipeline. As you will see, this is not all that big, perhaps 250 mm in diameter. In 2017 the pipe was totally covered with sand, but its location is very obvious. It is supported every 15 metres or so by some cross-bracing that has large concrete blocks at the ends. 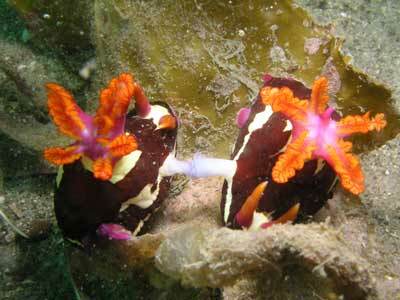 These are covered in beautiful sponges (see the photo above left). As of 2017, the cross bracing has either fallen off or sunk below the sand. Head north along the eastern side of the pipe, again, zig-zagging as you go. When you get to a little over 12 metres, the sand in front of you appears to rise up a bit to form a sort of hill. It actually shallows a metre and then returns back to about 12 metres. This happens a couple of times. You will take about 10 to 12 minutes to cross this 12 metre depth section, depending on how quick you explore. Finally, you will start to drop and over the next seven or so minutes you will drop to 18 metres. Here the pipe ends. You may not get this far if you have gone slow and spent a long time getting to this location (it is so interesting). Anyway, you can go as far as you like. When you have decided to return, cross over to the western side of the pipe and return back to shore in a similar manner. Take as much time going back as you spent going out to the end. There is as much to see on this side as the other side. Once you get back to the six metre level, head to the south-east till you are in the shallows and then surface and look for the exit spot. The third way to dive this site is once you are in the water, head north till you get to about seven metres, then turn right and follow this depth for a good 15 minutes. Then go a little deeper to 10 metres and turn left and head back at this depth till you hit the pipeline. This has a huge number of small bommies, the remains of fish traps/experiments which are home to all sorts of marine life. 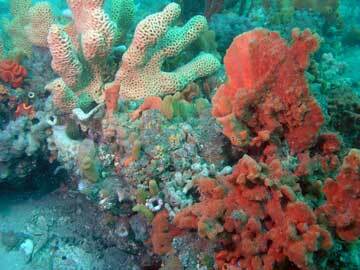 This is a truly fantastic dive site, one worth doing time and time again. Visibility here is not as good as Halifax Park or Fly Point, but it can get to 10 metres regularly and perhaps 15 metres on occasions. 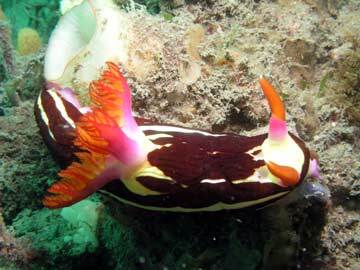 Things to see include many species of nudibranch, moray eels, decorator crabs, pygmy leatherjackets, octopus, yellow boxfish and lots more. 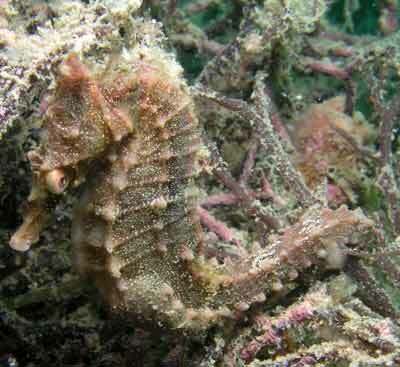 I have also seen sea horses here. NOTE: When doing this dive, never surface if you lose your buddy as many boats pass over the site and you will be in great danger. Head south back to the shore and only surface when next to the rocks.